The Observer and the hacker: shame on the Guardian, shame on the Government - Salut! First, I should declare my interests. Before I get round to criticising it, let me say The Guardian has always been my preferred daily newspaper. I gave it one last chance to employ me before I embarked on my marathon stint at The Daily Telegraph, and didn't hold anything against it for resisting the offer. People should not be astonished at that; journalists in my experience rarely worked for papers because they shared those papers' editorial opinions. The Mirror newsroom was reputedly full of Tories; leaving aside the Right-wing "thinkers" it inevitably attracted and who had sometimes done little real journalism anyway, the Telegraph was remarkably free of them. All that mattered to the editors, especially if you were a mere hack or sub, was whether you could do the job they paid you for. The Telegraph was a great newspaper to work for. The other interest to declare is that on what could be termed two-and-a-half occasions during my career, I was offered jobs by the Daily Mail. The half was an informal approach that led nowhere; the others were actual proposals for employment, one of them very generous. But it is fair to say that I rarely agree with the Mail's view of life. 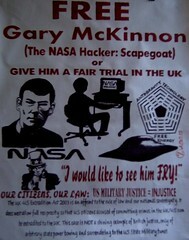 Yesterday, I found myself in complete support of its campaign to halt the extradition of Gary McKinnon to America. McKinnon is wanted by the US authorities for hacking into military networks. Readers with exemplary memories may recall that when I mentioned his case in passing nearly three years ago, "Smiley" - a reasonably regular commentator on Salut! postings - offered this opinion: "As for computer hacker, I hope our cousins across the water lock him up and throw away the key." I understand and share the annoyance most feel towards those who hack into computer systems, spread bugs and generally make a dreary nuisance of themselves. My complaint is that the Americans might indeed lock him up and throw the key away, given the absurd nature of a judicial system that permits judges to pass sentences that make a mockery of human life expectancy. If McKinnon is guilty, he is guilty of acts committed on British soil. The effects were felt in the US, but the logical extension of therefore justifying extradition is that if he killed a Californian in Widnes, he should be tried in LA because the effects were also keenly felt there. A simple principle is at stake: no British government should allow one of it citizens to be dispatched to a country where the punishment for his or her alleged offence would be grotesquely more severe than could be expected from a British court. McKinnon, we are told, could face 60 years' imprisonment if extradited. The obscene three-strikes-and-you're-out laws, which can and have put people behind bars for ever if they commit a trivial offence that happens to be their third, is one example of American justice at work. The ludicrous Madoff sentence is another (if a man deserves life, give him life instead of imposing unservable lengths of time that make judges look innumerate or simple-minded). The French want to repatriate one of their citizens, Florence Cassez, precisely because the inhuman 60-year sentence passed on her by a Mexican court would be reduced were she to be in France. The crime, involvement with her boyfriend in kidnappings, certainly merited severe punishment (she denies guilt, but that is not the point); I suspect the appropriate term in France would be 10-12 years. British judges, supported by some but not all British ministers representing a party that used to be big on human rights, are happy to send one of their fellow-citizens to a land where they know perfectly well he will be subjected to disproportionate punishment if convicted. And why do I want to criticise the Graun? Well, I don't unless it is true, as reported elsewhere, that the men (and, I see, woman if not women) in suits who now occupy high managerial positions there want to close down The Observer. Not only is The Observer the world's oldest Sunday newspaper; it may also be the best. In my view, it is beyond question the best of the bunch in Britain. If it is closed down, or squeezed into a Thursday magazine, I shall never read the Graun again.